Australia Day is always a big day in local government. At Yarra Ranges it's a day where we award community contribution with our Australia Day Awards and also hold a Citizenship Ceremony as part of the day. It is always a delight to see a Lyster Ward resident take up citizenship at a Citizenship Ceremony. I started my day at Burrinja, my official role at the Citizenship Ceremony was to do the "Welcome to New Citizens" speech on behalf of council. It's a privilege to be part of the proceedings. 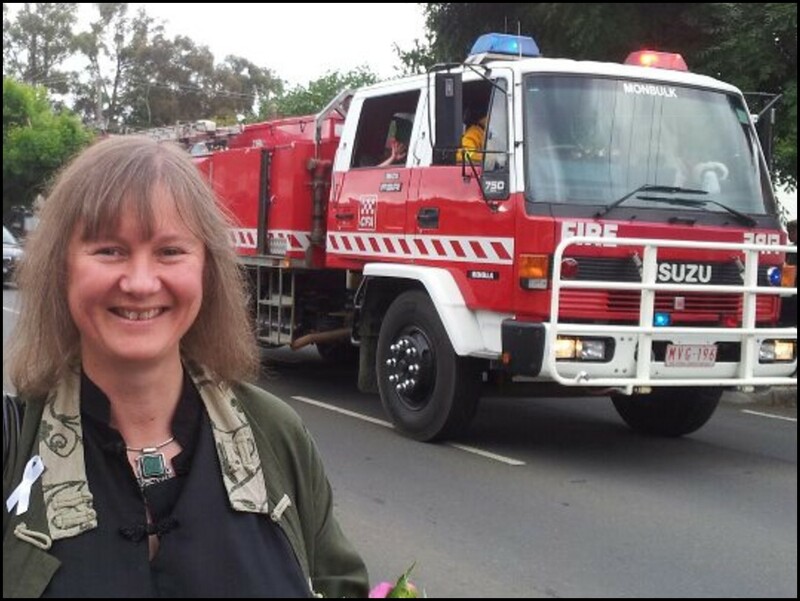 "...As a Yarra Ranges Councillor I welcome, embrace and value the diversity of views and backgrounds of our citizens. You enrich the social fabric of our wonderful shire..."
Always a joyous occasion, it's great to be able to share the event with people from all walks of life, some who've only been here a short time, some who've been here a very long time. 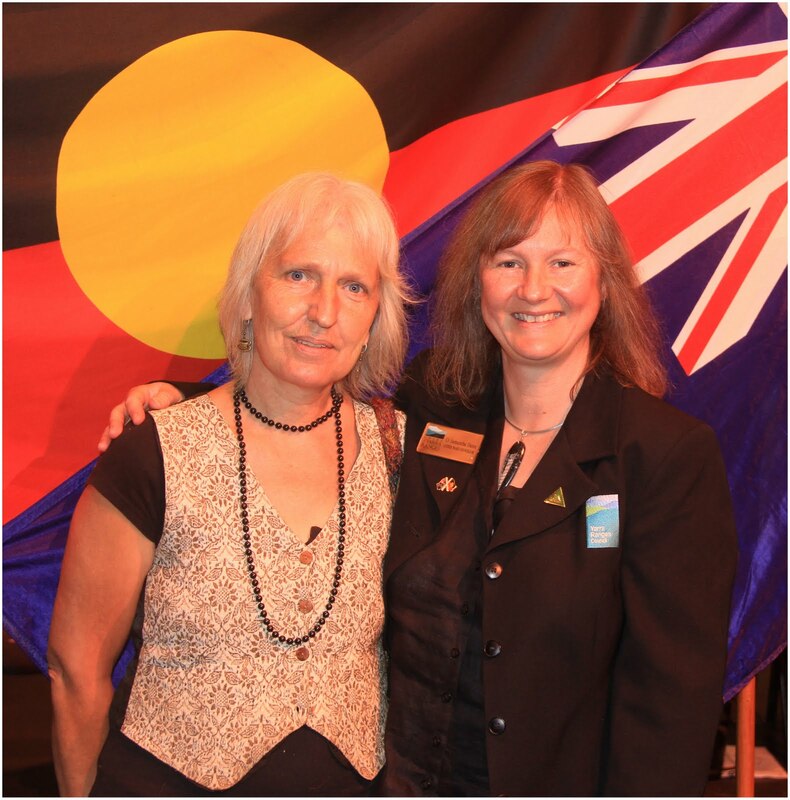 Burrinja was also the venue for the Yarra Ranges Australia Day Awards. It was wonderful to be able to present the Ken McIntosh Memorial Award for Young Environmental Achiever of the Year, Jordan Crook. 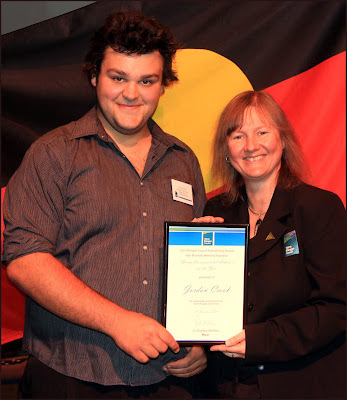 Jordan Crook and Cr Samantha Dunn, Lyster Ward at the Yarra Ranges Australia Day Awards. This award honours the contribution of Ken McIntosh who was a driving force in environmental and conservation issues in the Yarra Ranges. Jordan is a passionate advocate on the environment and social justice. During his time as a student at Sherbrooke Community School, Jordan was committed to the education of fellow students as well as the broader school on a range of environmental issues. Supporting the Sea Shepherd is one of Jordan's key passions and the issue of whaling got a mention in Jordan's acceptance speech as well as the issue of logging in the Toolangi forests. He played a key leadership role at his school and led the charge in making the school more sustainable. 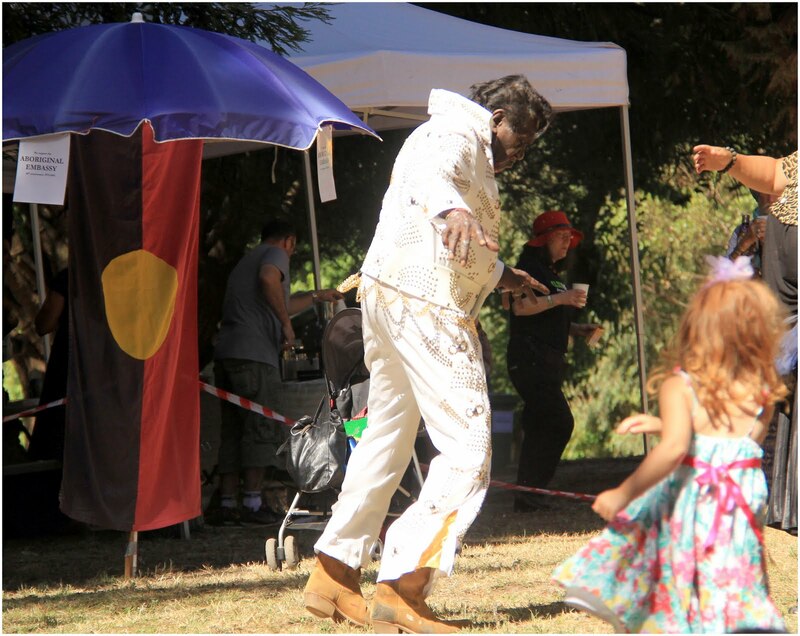 He has continued his leadership role and is currently involved in the Belgrave Survival Day organising committee. He is an inspirational example of a young person committed to protecting the environmental and cultural values of our region, now and into the future. Certificates of Recognition - Alice Keogh, Jillian Hess & Dorothy Barber. Congratulations to all our winners, your contribution to the shire is exemplary and you make Yarra Ranges a great place to live. What a great celebration of Indigenous Survival at Belgrave Survival Day today. It was terrific to join with over 1,000 people across the day to celebrate the world's oldest living culture. 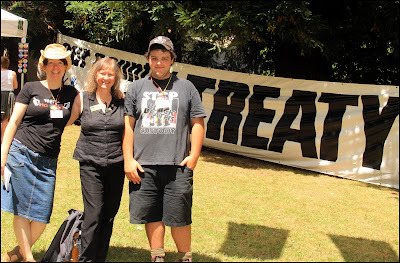 Pictured left to right: Belgrave Survival Day organiser Jane Thomas, myself and another organiser Jordan Crook. They have worked tirelessly to bring this event to the people of the hills and beyond and they did a great job. 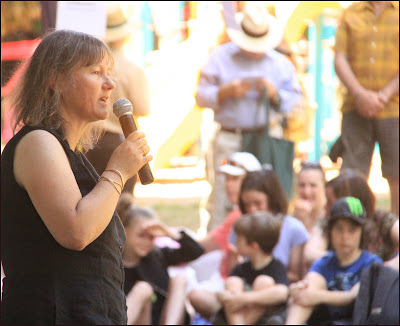 I had the great honour of speaking at Belgrave Survival Day. I talked about council's commitment to our Indigenous community. I am proud to support Belgrave Survival Day with funding from my Community Ward Fund and Council is proud to support the event with funding from our Community Grants program. Bunjil, the wedge tailed eagle, flew overhead today. Bunjil is the creator spirit of many Aboriginal clans in Victoria. 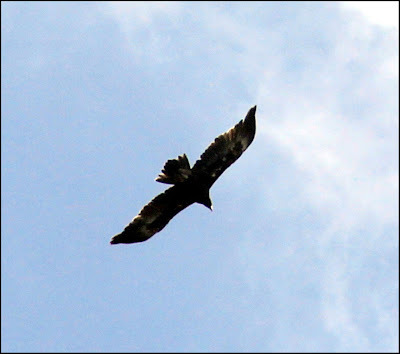 It is always breathtaking to see a wedge tailed eagle and a real treat to see one at Belgrave Survival Day. Yarra Ranges Council was the first council in Victoria to adopt a Statement of Apology. It was drafted in collaboration with the Shire's Indigenous community. "The Yarra Ranges Council recognises the past injustices and treatment of Aboriginal Peoples. If we are to proceed in an open hearted and responsible way to address the issues which will come before us in the future we first need to acknowledge the past. Council recognises the need to confront the policies and practices which caused the forced removal and separation of Aboriginal children from their parents and families, the effects of which continue today. Accordingly, we wish to express our deep sorrow and sincerely apologise for the pain, the grief and the suffering experienced by Aboriginal Peoples as a result of past laws, government policy and actions." - Building stronger relationships and new partnerships with the wider community in order to promote business and employment opportunities. Gnarnayarrahe Waitairie led the crowd in a didgeridoo meditation. - council continues to take a lead role in advocating for the Outer Eastern Aboriginal community through a range of state goverment forums and networks, most recently providing a submission to the review of the Aboriginal Heritage Act. 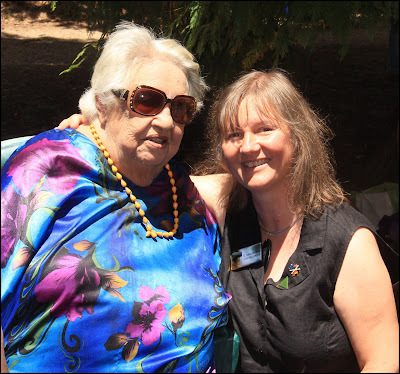 It was terrific to catch up with Aunty Dot Peters, she's been a great supporter of Belgrave Survival Day and has spoken at every Belgrave Survival Day. I thought it important to mention Constitutional Recognition of Indigenous Australians. The Federal Government has committed to a referendum however given the past success rates of referenda in this country it will be difficult to achieve. Of 44 referenda only 8 have succeeded. I spoke about my hope for a simple, straightforward question that people could easily support with wide consultation and a well resourced education campaign to accompany it. 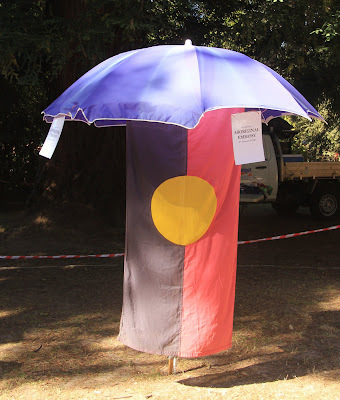 Belgrave Survival Day organisers marked the occasion of the 40th anniversary of the Aboriginal Tent Embassy with this umbrella (to mark the beginnings of the embassy). I couldn't go without mentioning the 40th anniversary of the Aboriginal Tent Embassy - I salute all the people who've maintained the site, you are an icon of Indigenous struggle in this country. I was also pleased to report to the crowd that we'd had reports from the Aboriginal Tent Embassy that around 2,000 were in Canberra. Indigenous people still face significant disadvantage in contemporary Australia, particularly in health, education and employment outcomes. The Yarra Ranges Council support the rights of all Indigenous people as outlined in the United Nations Declaration on the Rights of Indigenous People. We are committed to reconciliation and strengthening our relationship between Indigenous and non Indigenous communities. We take pride in our Indigenous cultural heritage. 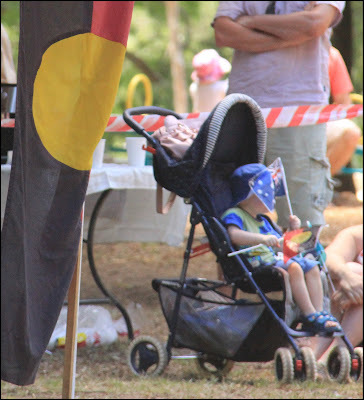 It was a terrific day, it was wonderful to see so many people come out to celebrate the survival of Indigenous culture. There was some great entertainment on the day. 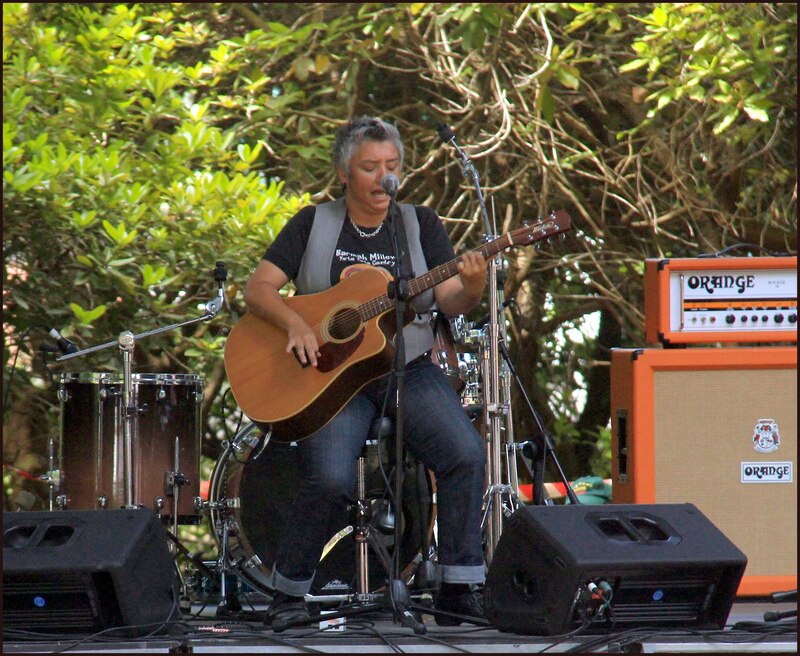 This is Lou Bennett, a Yorta Yorta/Dja Dja wurrung woman and co-founder of the female trio Tidddas. 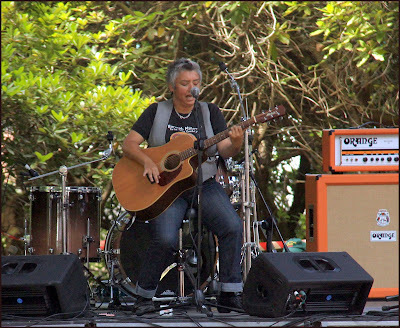 Lou has been an integral member of the Black Arm Band as well as venturing into a solo musical career. Yung Warriors treated the crowd to some deadly tunes. Yung Warriors are an emerging hip-hop act comprising Tjimba Possum Burns and cousin Danny Ramzan (D Boy). Both in their 20's they share the same grandfather in legendary painter, the late Clifford Tjapaltjarri Possum. We were treated to a surprise performance by Black Elvis. In its fifth year, Belgrave Survival Day is going from strength to strength. This year the most successful by far. Once again my congratulations to the organisers, you did a great job and I thank you. 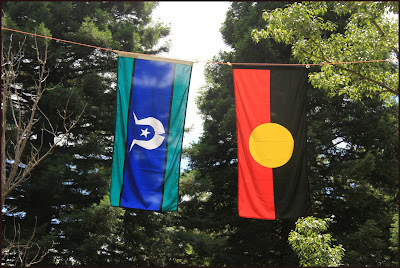 For more photos from the day visit Belgrave Survival Day official website. Fair Projects did a great video on the day featuring interviews with Aunty Dot, Uncle Bill Nicholson and one of the event organisers, Jordan Crook. 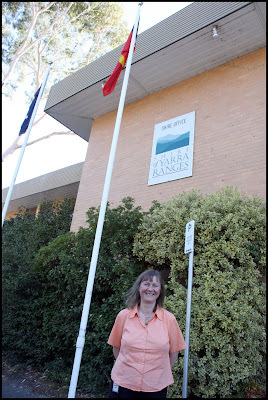 The declared fire danger period will commence Monday 23 January, 2012 in Yarra Ranges. After this date no open air burning is permitted without a permit. It's well and truly time for you to have thought out your fire plan, make sure your family knows the plan and you've rehearsed it. If you're not sure if you're allowed to light a fire please click here for more information. If you'd like more information on fire preparedness click here. If you'd like to find out where your local CFA Community Meeting is in Yarra Ranges click here. This year an awareness campaign has been launched to report bushfire arson, if you see something or know something then say something by calling Crime Stoppers on 1800 333 000 or click here for Victoria's Crime Stoppers. Community members have contacted me because they've received a wad of documentation from Maccas (via Norton Rose) about the VCAT appeal. Although the paperwork can look a little daunting its very easy to lodge a "statement of grounds" and become a party to the appeal at VCAT. YOU MUST LODGE YOUR STATEMENT OF GROUNDS BY 26 JANUARY, 2012 TO VCAT, COUNCIL AND McDONALDS. By lodging a "statement of grounds" doesn't mean you have to present a verbal submission to VCAT (but you can if you want to), it doesn't cost you anything to lodge, it is a very important way to make sure your voice is heard and your concerns are taken into account. So don't be daunted by the paperwork, this is how you make sure the VCAT Members know how you feel and how the application will impact on you. Remember, just like the council process, it's important to make sure your "statement of grounds" is based on planning matters. If you'd like to read the reasons I raised at the council meeting click here. I have had a long record of supporting hail netting for farmers in Yarra Ranges. The Lyster Ward contains a significant orchard sector covered in hail netting. In what can only described as bizarre, the Minister for Agriculture, today released a statement slamming Yarra Ranges as having "stupid Yarra Ranges Council policies" because the Minister believes we want to restrict the use of hail netting. The Minister's release was made after visiting the destroyed crops of Yarra Valley strawberry growers. The full quote, "But what makes it disappointing is that the damage could have been minimized (sic) except for stupid Yarra Ranges Council policies restricting use of protective hail nets." No Minister, Yarra Ranges Council does not have a policy restricting the use of hail nets, we have a planning scheme that requires a permit to construct hail netting, but it doesn't say you can't have them. This is Montagues Orchard in Lysterfield (in my ward). Their use of hail netting protects their crops, means they use less water and chemicals, have less contamination, they don't need to use bird/bat scarers and their netting also helps to stop sun damage. A great benefit for the agricultural industry. The Minister went on to say, "For many growers, hail netting provides the best form of protection against hail, yet council policy limits orchardists in green wedge zones to covering a maximum of only 60 per cent of trees in hail nets, meaning almost half their orchard is left exposed to storms." No Minister, Yarra Ranges Council does not have a policy limit covering 60% of trees, we do have guidelines that talk about 60% coverage of the site (not trees), however there's nothing to stop any grower for applying for 100% coverage of their orchard. Minister you must remember that site is the total farm and will most likely contain farm residences, farm sheds for equipment, packing sheds, cool rooms, driveways, etc so no farm will need 100% site coverage. Further quotes from the Minister include, "It is wrong that Yarra Ranges Council thinks it is more important to give people in passing cars an unblemished green vista than to protect farmers. Farmers should have a right to protect their entire orchards and businesses." No Minister, Yarra Ranges Council does think we should support farmers and they should have a right to protect their crops. Yarra Ranges Council has never refused an application for hail netting. We recognised a more contemporary approach to horticultural structures was needed when we endorsed our Green Wedge Management Plan in July 2010. As recently as September 2011, we wrote to your government about the need to review the permit requirements associated with horticultural structures (this includes hail netting). We highlighted to your colleague the Minister for Planning that there are opportunities to investigate reducing the need for permits for horticultural structures. Yes Minister, you could amend the planning scheme (we can't) and make it easier for our farmers, you could also think about letting them sell their value added produce at the farm gate too at the same time, because you wont let them do that either. That would be far more productive for our farmers than slamming the Planning Scheme, something the Yarra Ranges Council administers but can't change without the approval of government - that's you. And as I said earlier, I have long been a supporter of hail netting, it's benefits are enormous, as far back as November 2008 I wrote about the issue (see blog 2/11/2008). This is the hail netting (horticultural structure) that council approved back in 2008 in Coldstream at the gateway to the Yarra Valley, we haven't knocked back one application for hail netting yet. With 4 million visitors to Yarra Ranges every year there's plenty of people who drive past this. In July 2008, council had to consider a hail netting application, you can read more about my support for here. There's no question about the support for farmers from Yarra Ranges Council, perhaps we could see some positive changes from government too so we can support them even more.